I have been twisting knobs professionally for over 10 years. After earning a degree at L.A.R.S (Los Angeles Recording School) in Recording Arts, I worked at Cherokee Studios and Nightbird Studios in Los Angeles. Eventually I came in contact with Grammy nominated Producer Johnny K and engineered Plain White T's "Big Bad World" leading to the opportunity to work along side Johnny K and engineer his future projects at Groovemaster Studios in Chicago. While doing so, I had the pleasure of working with Sevendust, Disturbed, Plain White T's, Anthrax, Alien Ant Farm, Finger 11, Pop Evil, Nonpoint, Airbourne, Staind, Trapt, and many other major label acts. I currently own and operate Command Space Audio in Chicago. As every artist will have a different vision, each project will be approached differently but will still have the same professional quality result. I am flexible with multiple song discounts to cater to bigger projects. Feel free to inquire. Daniel did an awesome job on my track. Will definitely use him again! Got a great mix from Daniel, would definitely recommend him. Great experience from beginning to end working with Daniel. He was able to deliver exactly what I was looking for. I'm looking forward to working with him more and would definitely recommend him to anyone looking to take their music to the next level! On the other side of the world but professional enough to know what our music needed for the mix. Brought it to a higher level. Daniel is a genius at mixing. Perfect results every time. Daniel is an amazing engineer, every song sounds like a radio hit, the best at what he does! Daniel is a masterful engineer, A perfect mix for a busy song! If you are looking for an awesome mixing engineer who will collaborate and take your ideas and turn them into something even cooler, this is your guy. Looking forward to working more with Daniel, and super happy with the mixed and mastered end product of my song. Daniel is an impeccable professional who knows exactly what he is doing. Great work by Dan, really listens and is able to bring the mix to life! Great working with Dan again on this track, sound came out loud, exciting and crystal clear! Dan was excellent on this project. He got the exact sound I was looking for and I'm delighted with the results. I highly recommend anyone to use Dan if you are looking for high quality results. Dan was great with my mix, very patient, understanding, especially since I have limited recording experience. Was delighted with final mix and master and will definitely be using Dan again! Great experience working with Daniel! He helped me reach my vision and shape the sound I was aiming for. I will definitely be returning to get more tracks Mixed and Mastered. Daniel hit the nail on the head with this mixing project. 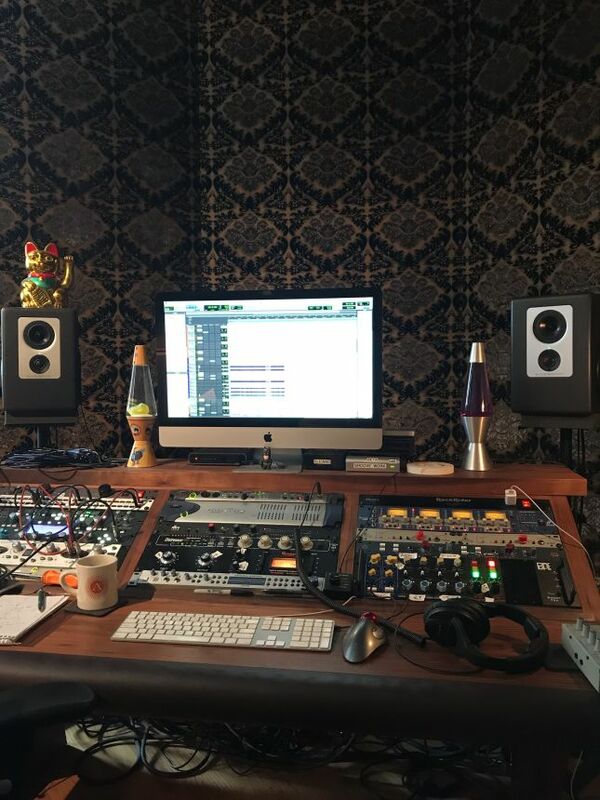 We were on a tight deadline and needed 5 songs mixed within a week and were surprised at how quick, responsive and awesome Daniel was given all the time contraints. He also worked Artist hours which helped with the late night 3am changes we needed. Daniel was awesome to work with! The quality of every single song Daniel worked on was fantastic. He was very polite and understanding of my goals for the project and was extremely knowledgeable on how to achieve the best sound and managed to meet my tight deadlines despite it being a very busy period for him. An all-round pleasure to work with! Great Mixing Engineer, and a breeze to deal with. Looking forward to working with Daniel again. Daniel is awesome to work with. He was extremely accommodating and listened to all the notes I provided him with. He worked with me until I was completely satisfied with every little detail of the track! Great with communication and a very professional and talented sound/mixing engineer. Would most definitely use his services again! I've worked alongside Daniel for the past 5 years at Groovemaster Studios and can personally vouch for his ability and professionalism. The importance of a laid-back and confident vibe in the studio cannot be understated, of which he surely possesses. He's pretty damn good…for a Lakers fan! ☺ Highly recommend! Daniel is an absolute pro, and one of the single largest reasons why our previous album achieved the successes it did - two singles in the top 20, and both of them accumulating over a year total on the top 40 as well as topping numerous "most played" lists for various national radio, satellite, and internet stations. One of the best in Chicago. Amazing engineer with an incredible ear. Tells it like it is and will push you to get better. A true professional. My experience working with Daniel has been incredible. He has taken my original music to a whole new level of quality and professionalism. A high level professional in every way. I plan to work with him on all of my future projects. Best engineer in Chicago. No question. Daniel is an amazing producer with a stellar ear. Having worked with him along side platinum selling artists he is the first person I call for my artists records. A fantastic, attentive engineer who is absolutely on top of his game. Probably one of the top hard rock engineers in Chicago, and an absolute pleasure to work with. I fully plan on working with Daniel again in the future! Daniel's a total pro. He's got an acute ear for drums and guitar tone. I've hired him as an engineer as well as worked alongside him. In both cases he was professional and easy to work with. Given his pedigree of major label experience and almost freakish sense of hearing I'd trust him on just about anything. A: I was blessed to Produce, Engineer and Mix "Stoop Goodnoise", a band from Chicago and we just completed the new LP coming out in January. A: Just got the new "Stoop Goodnoise" record back from being mastered by Brad Blackwood at Euphonic Mastering, you can hear it on my profile. A: Both! Because recalls or easier digitally but hitting analog compressors, EQ's, and Pre's adds a vibe thats different from plugins. A: I get to be creative and help others finish a vision that they started. Every project is a new canvas for me. Essentially people trust me with their babies. A: After earning a degree at L.A.R.S (Los Angeles Recording School) in Recording Arts, I worked at Cherokee Studios and Nightbird Studios in Los Angeles. Eventually I came in contact with Grammy nominated Producer Johnny K and engineered Plain White T's "Big Bad World" leading to the opportunity to work along side Johnny K and engineer his future projects at Groovemaster Studios in Chicago. While doing so, I had the pleasure of working with Sevendust, Disturbed, Plain White T's, Anthrax, Alien Ant Farm, Finger 11, Pop Evil, Nonpoint, Airbourne, Staind, Trapt, and many other major label acts. I currently own and operate Command Space Audio in Chicago. A: I would like to say i am pretty laid back. I like to push the artist to play solid takes so the music doesn't need a ton of edits. I like things to sound natural and human, an element missing in modern music. A: I work on a lot of Alt-Rock, Indie Rock, and Hard Rock. A: Im not afraid to tell an artist if i think an idea is weak and that i know they can create something better. I like to push them so that they know they tried their hardest to make a record that will be with them forever. A: I bring a fresh ear and unique perspective to any given song. I try to make new sounds if i am engineering and not scared to record every idea to see what it does for a song. A: When it comes to making a record I typically listen to a band or artists previous work/live performance to see what the vibe is and what they have/havent done. When it comes to a mix I would ask the artist to send me references if they are digging another artists sound. I would also listen to the rough mix that is sent to hear if there is anything specific or cool that i would want to keep in my mix. A: Where do i begin... 27" IMac Pro Tools Ultimate Avid HD Omni with 192 16x16 Barefoot Footprints NS-10s WA76 Distressor DBX160A BAE 1073MP Chandler 500 MK ii X2 CAPI VP312 X4 Skibbe Electronics 736-5 X2 BLA B12A X2 Focusrite ISA-428 Avalon U5 X2 and a whole bunch of guitars, pedals amps, and microphones. A: There are so many artists and other professionals that inspire me and push me to become a better Mixer/Engineer. No matter the genre i can fine something special that will catch my ear, weather its a cool effected overdub or a cool snare drum that hits you in the chest. A: Through SoundBetter most of my work is Mixing and some editing. At my studio Im Producing, Engineering, and Mixing full projects and send out to mastering for a fresh ear. Mixes include 4 revision, each additional revision is billed $30 per. Feel free to reach out to discuss your project and mixing needs. You get what we agree on and pay for. Willing to accommodate to most budgets. Discounts on multiple song projects.